The Noble fir tree is native to the Cascade and Coastal ranges of Oregon, the Siskiyou Mountains located in northern California and in Washington. The tree is considered to closely resemble the Red fir tree which is found in California. The tree grows which is associated with other conifers grows in the middle to upper elevation of the coniferous forest. The tree is attractively symmetrical and can grow to a height of two hundred feet and above. The Noble fir tree is characterized by needle shaped foliage which resemble a spruce. The needles are four sided and can grow to approximately one inch long. They are usually twisted upwards to expose the lower surfaces of the branches. Individual needles have a bluish-green color which appears to be silvery due to the two rows of stomata below and one to rows above the surface of the needles. have scales which are enclosed by sharp pointed shaggy- edged bracts. Its heavy seed cones are concentrated in the top parts of the tree branches. Upon maturity, these cones dissipate in order to release the seeds. It has a relatively smooth bark which is characterized by resin blisters during its early stages of growth. Its bark changes to brownish grey as it ages. 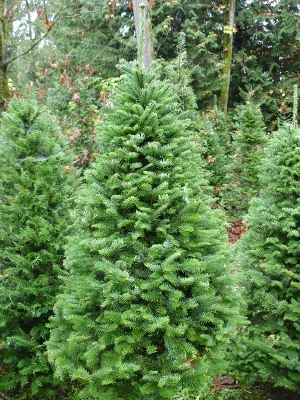 The Noble fir tree can do well in moist, deep rich soils in middle elevation areas. This tree is known to have long keep ability. Its seedlings can be grown in both containers and bare root after which they can be transplanted for at most two years before they mature. The tree can be used as a spectacular Christmas tree due to its long keep ability, stiff branches and beauty. It can also be used in the greenery business to make garland, door swags and wreaths.